The easiest and cheapest way to learn how to fly a heli. Also the recommended format for younger children. These capable machines are really the optimal starting point for the heli enthusiast that plans on taking it to the next level. Easy to fly with a little bit of training, these come in various sizes from micros that fit in the palm of your hand, to minis with blade spans of over a foot long! The most capable flying machines in the Mini class. The next step beyond these machines is the big time. We recommend some time on the flight simulator if this is your first heli. 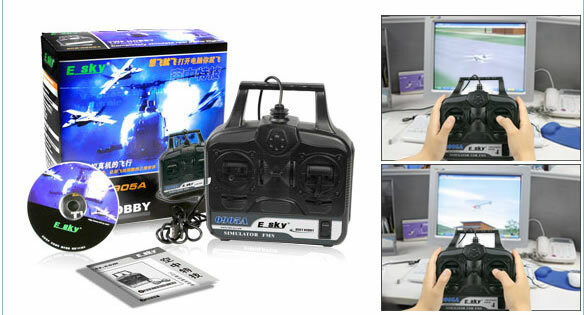 E-Sky 4 CH Flight Simulator Training Kit For Airplanes and Helicopters w/ USB Port is only $19.99. All rights reserved. The material contained herein may not be published, broadcast, rewritten or redistributed by anyone without the express written permission of the author.